The College of the North Atlantic St. Anthony Campus offers a variety of community and general interest programs that are available during Fall, Winter and Spring. I have personally completed Introduction to Basic Digital Photography and Rug Hooking. I would love to take a class on seal skin boot making or snowshoe making. It is important we continue traditional ways of our parents and grandparents. Why not consider learning a rural or new life skill? 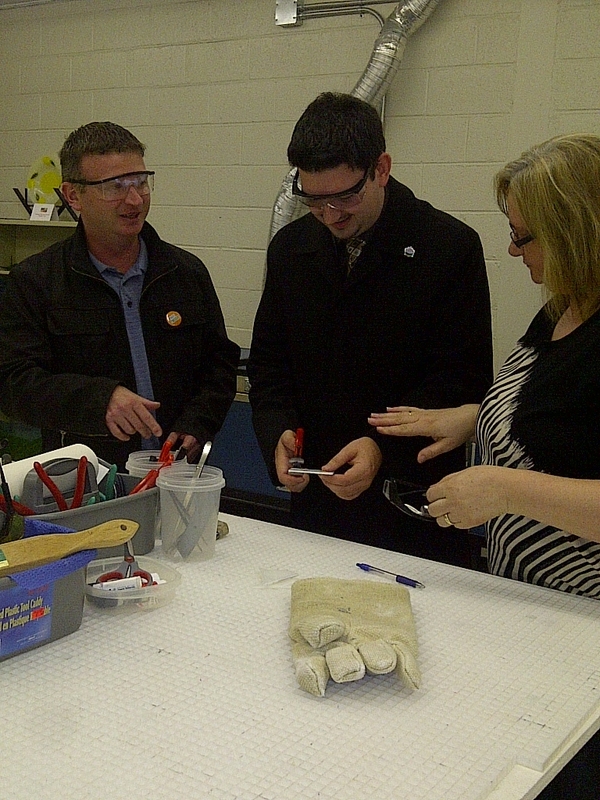 The College also offers acrylic painting, sewing, cake decorating, hunter and fisher program and many other courses. If you have an interest, give the college a call today at 709 454 3559! 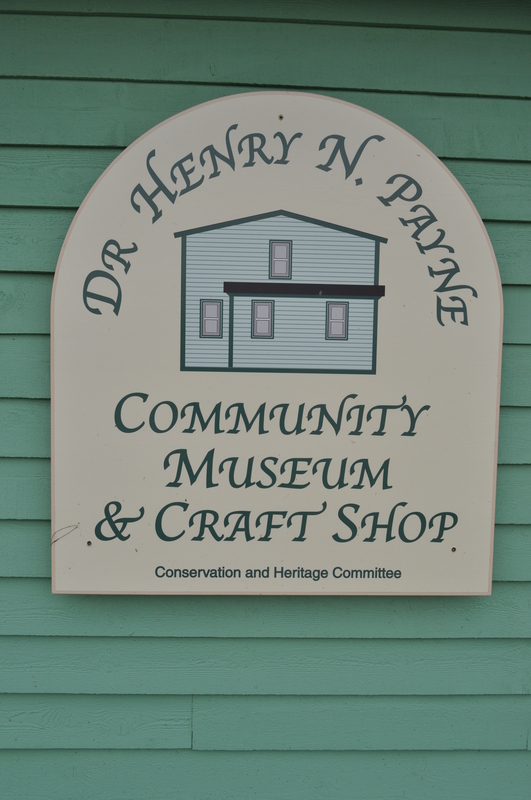 The Dr. Henry N. Payne Community Museum & Craft Shop at Cow Head, NL is within walking distance of the Shallow Bay Motel and the home of Gros Morne Theatre Festival. On August 4, 2011 I visited this Community Museum. It brought me back nearly a decade ago when I first started Flower’s Island Museum in Nameless Cove in July 2002. 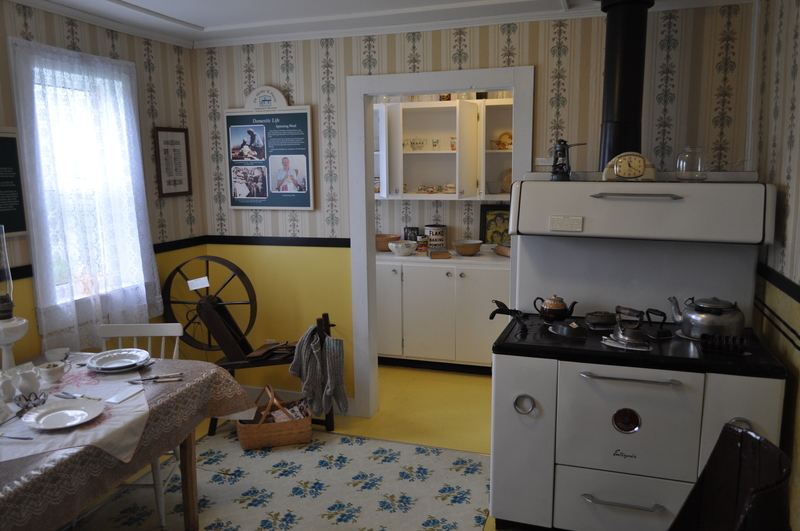 The old homestead similarly was filled with items of the 19th century and had stories adorning the walls highlighting baking bread, domestic life and past residents that were pillars of the community. Dr. Henry Payne was a dedicated teacher for 45 years, Justice of the Peace and a field worker for the Co-operative Movement. Since the 1950s the co-operative movement has continued to grow. Today, it consists of related organizations with significant influence in the agriculture, finance, insurance, fishing, retail and housing industries. Retail co-operatives play significant roles on the Prairies and in Atlantic Canada, according to Canadian Encyclopedia. Rural Communities were built around the cooperation of its residents. It led to development. We may have to re-visit the co-operative model and consider it for craft retail, tourism marketing, fishery and agricultural sectors on the Great Northern Peninsula. The Museum has a wealth of artifacts from the past. Entrance is just $3.00 and if under 12 there is no admission fee. The kitchen has the old stove, with flat irons ready to be heated for ironing clothes. In the pantry there was an old water pump in the basin and many old tins and cans, which were former homes for tea, spice, flour and other foodstuffs. The rocking chair below is a rarity. It certainly is one of a kind and a symbol of the times. This appears to be an old hooping barrel converted into a rocking chair. You may also notice the hinges on the seat. 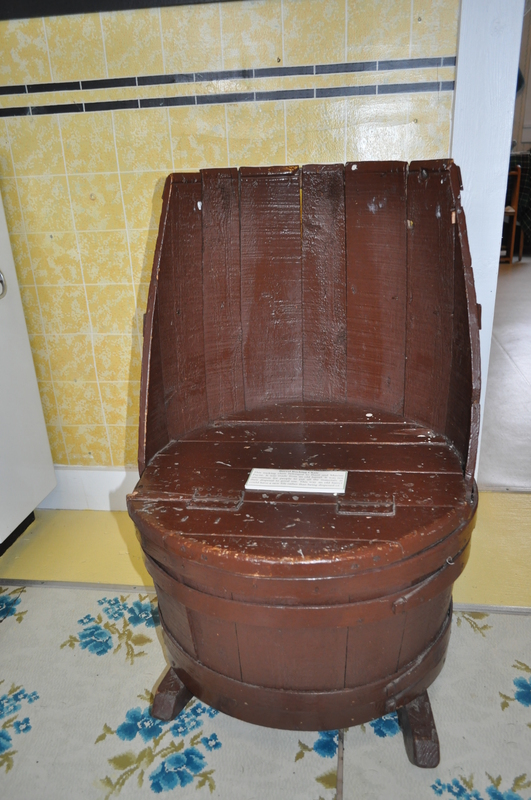 It was also good for storage – maybe the wife’s knitting and wool would be neatly stowed away. Nevertheless, this piece illustrates the ingenuity of a rural Newfoundlander & Labradorian. 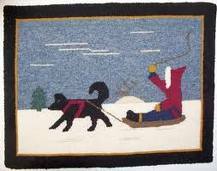 Rug Hooking has begun to see a revival on the Great Northern Peninsula. I have seen rug hooking kits for sale at many outlets, the Grenfell Interpretation Centre sells a variety of hooked rugs, the College of the North Atlantic had delivered a Mat Hooking course (which, I enrolled), many rugs were hooked in Englee and Main Brook. This is an excellent opportunity to place your images of Rural Life in an art form. Community-members could come together to form a rug hooking cooperative as was in the past with the Grenfell Foundation. People would send their stockings to the women of Labrador and the Great Northern Peninsula to hook Grenfell Rugs. If you have the time, drop by this museum. They are open until 8:00 PM! The two staffers working we able to answer my questions, as I can be very inquisitive at times. I like playing the role of a tourist even on the Great Northern Peninsula, as it is nice to see the product and service offering others experience when they visit local sites. Great job! Dr. Wilfred Grenfell, founder of the International Grenfell Mission supported economic development on the Great Northern Peninsula and Labrador. He organized co-ops, especially for local women to help supplement fishing or other incomes from spouses. A visit to Grenfell Historic Properties this summer outlined a quote of the Doctor, asking people to “send your stockings to Labrador”. The women would then take the silks and use them to produce mats or rugs to sale. Some residents today continue with this tradition and realize an opportunity to preserve tradition, generate revenues and expand your skills. The College of the North Atlantic, St. Anthony, is interested in offering part-time evening Mat/Rug classes in the Flower’s Cove area. They are attempting to determine the level of interest. Sufficient enrolment required in order for classes to commence. To express an interest or to obtain more information, please contact Joan Kinden at 709 457 2719 or Sabrina Gaulton at 709 456 2834. This is a great opportunity for residents of this region to learn a unique talent, make product or gifts that is one of a kind to pass on to family, friends or others locally and across the globe.